Queensland Blue Couch, this favourite lawn type is neither from Queensland, nor is it a Couch. Queensland Blue was made popular in Southern Queensland due to its optimum performance and suitability to that region, although it is also highly suitable to many other regions around Australia. Queensland Blue Couch has also been a long time and often used grass for home lawns for the Australian home, it has a lovely soft texture, mows beautifully with a cylinder mower or rotary, is less aggressive than real couches, and doesn’t thatch up nearly as quickly as Couch grass. Once mowed, it never leaves an unsightly appearance of cut and exposed stolons (runners) like other lawns may do. 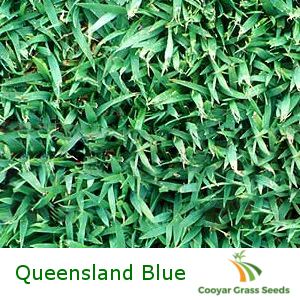 Ideally Queensland Blue couch should be mowed between between 12-20mm and sowing rate is 1kg per 100sqm (For oversowing), 2kg per 200sqm (For new lawns). Areas: QLD, WA, NSW, NT, SA and ACT. I’ve bought from Cooyar Grass Seeds a couple of times now, their shipping times and overall communication is really good, I don’t have anything bad to say about them. What I would say is with regard to the grass seed, perhaps buy a little more then you’re thinking. I originally ordered 1kg to do a 100sqm area. When I got the seed I planted it all in one go and realised only when it startrf to grow, that some of the seed had grouped together which resulted in patches forming in my lawn. I then bought another 0.5kg to oversow the patches. I’d recommend for anyone looking to grow a new lawn, to not plant all the grass seed in one go or buy some extra so that you can oversow when the patches form.